Pauline Baynes, original illustration for Voyage of the Dawn Treader, Collier Books, 1970. Digitization courtesy of the Internet Archive. I thought about it late and then early again this morning, why is it that we lay the book down in the middle of reading it (or else clutch it to us) and stare off, as if to assimilate the beauty found there and integrate it within the here — to keep it here — to make it, so to say, real. I teach a writing course to MFA students in fine arts, who must produce a written thesis about their practice in order to graduate. This fall, a student told me, wistfully, that instead of answering my various writing prompts about how and why she makes paintings, she would prefer to explain which of her paintings she would choose to swim in. To imagine immersing oneself in a painting is a reverie both of synesthesia, where vision turns into touch, and of pure presence. Using language to create and navigate this fantasy renders the process one of constant translation. C.S. 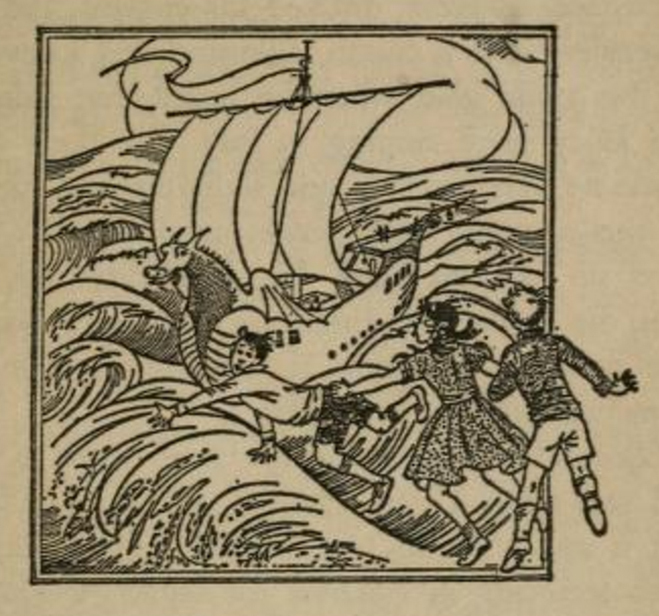 Lewis stages a version of this fantasy in Voyage of the Dawn Treader. Rather than his iconic wardrobe as the portal to Narnia, in this novel the characters enter an alternate world via a painting of a Narnian ship. 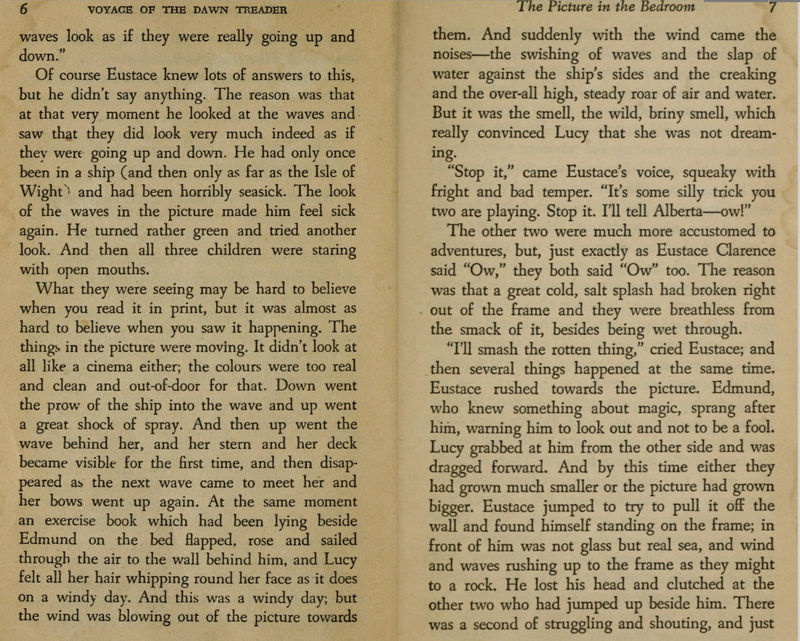 The painting described immediately serves as an analogue — or an isomorph — for the novel itself. Creating an impression of reality or conjuring a real-seeming presence is one of our deep desires for written language, and it is built into the very structure of high fantasy novels like Lewis’, where the believability of and gratification in the universe created is at stake. C.S. Lewis, Voyage of the Dawn Treader, Collier Books, 1970. Digitization courtesy of the Internet Archive. I understand the impulse to try to swim in a painting. I spend a lot of time trying to write about work so that readers know what it was like to be there with it. The classic structure of an art review is to describe, to interpret, and to judge. I spend as much time as I can in the description. For me at least, the process of making professional art criticism is in large part an attempt to capture, preserve, and recreate an experience of work and transmit it, via phantasia, into the minds and bodies of readers. In many cases, these critical texts will be the only ways these readers will access the exhibition or installation. To be clear, the activity of writing about art, especially an exhibition at a commercial gallery, and specifically in the context of a magazine that is part of the art market’s infrastructure, takes part in the deep machinations of the art market; there is nothing “pure” about the impulse to recreate an experience once it becomes part of this reproductive economy. Peggy Phelan criticizes the “smooth machinery of reproductive representation” that art writing devoted to mimesis traffics in, arguing convincingly that the mimicry of writing “relies on a substitutional economy in which equivalencies are assumed and re-established.” (And she somewhat idealistically privileges performance for its inherent resistance to this process.) But for most of the world we experience, the substitutional economy is what we have and what will have to do. The ephemerality of all experience and the endless retreat of the thing itself means that we are always trailing behind, trying to capture some of what we had. On the one hand, then, the fantasy of diving into pure presence. On the other hand, the knowledge that our exchanges of words for what we had will always fall short. The crucial equivalencies for Phelan: describe = defer = displace. There is a proper name and history for description that attempts to make present: ekphrasis, born in classical Greece but only popularized as a literary activity during the first centuries CE, as the first novels were beginning to emerge. Classical Greek ekphrasis was a rhetorical, educational activity attempting to bring something before the eyes. Lewis’ description, a classic ekphrasis, nests the painting that nests the world; and in the plot of the novel, he tilts the nest so that the worlds bleed into one another. But this is part of the fantasy of ekphrasis, too. Where there are attempts to touch through communication and to make things present, absence will be always be created as well. So W.J.T. Mitchell describes ekphrasis as a kind of “nesting without touching or suturing” — action at a distance rather than a physical touch. Rineke Dijkstra’s 2010 video installation The Weeping Woman, Tate Liverpool, transforms and explores the rhetoric of ekphrasis through its various gaps and absences. The Weeping Woman, Tate Liverpool, is at one level a sympathetic portrait of school children discussing Picasso’s 1937 painting The Weeping Woman. As with many of Dijkstra’s subjects, the children appear unaffected and vulnerable, and the camera settles on their faces with a gentle humor as they attempt to describe the Picasso painting that they see. The shots rarely capture the entire face of the child talking, often focusing instead on those who are silent. Arms slung around shoulders and the tops of heads jarringly point to the arrangement of bodies outside the frame. The camera immediately emphasizes what cannot be captured by even its seemingly omniscient gaze. 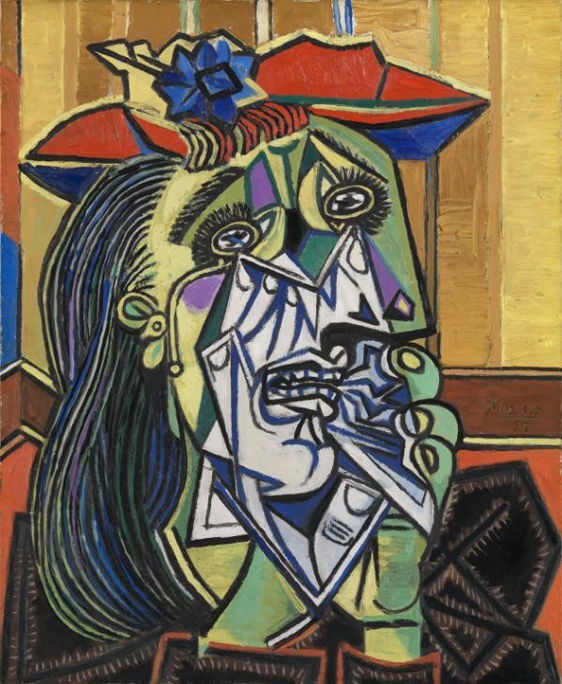 Weeping Woman, Pablo Picasso, 1937, Photo: © Tate, London 2017. In the end, the children end up mostly just repeating each other (not unlike many art critics). Once one child starts to mention all the colors he sees, the others echo each other like a round, reciting that they too can see “loads of colors,” shapes, and feelings in the picture. They substitute their own impressions for words that are already at hand. Just as the children themselves are in between states of maturity, the triptych video lies formally between a portrait and a landscape, neither independent from Picasso’s painting, nor merely a description of or a parasitical attachment to it. Dijkstra has created a work about being on the brink between forms, and this is as much about the drive, and failure, of ekphrasis to cross mediums as it is about the process of growing up and into the world. It is impossible to swim in a painting, but there is a reason that books about swimming in paintings are marketed to children, whose imaginative stances haven’t yet divided and grown up from and out of a world in which paintings can spill into a room and nests can be portals and places in which to hide and escape. Gumbrecht, Hans Ulrich. Production of Presence: What Meaning Cannot Convey. Stanford, CA: Stanford UP, 2004. Lewis, C. S., and Pauline Baynes. The Voyage of the Dawn Treader. New York: HarperCollins, 1994. Phelan, Peggy. Unmarked: The Politics of Performance. New York, Routledge, 1996. Mitchell, W.T.J. “There are no Visual Media.” Graud, ed. Media Art Histories. Cambridge: MIT Press, 2007. Aristotle, De Anima, throughout but especially Book III Chapter 3.